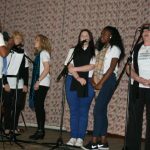 12th January Report on successful bid for Development Stage HLF grant given to PCC meeting. Vote taken to go ahead with the Development Stage (& raise the necessary match funding). 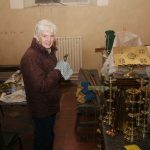 16th February Letters sent to members of the wider community interested in joining or helping with the Project Team. 8th March PCC meeting – formal approval given to accept the tender of the architectural firm, Thomas Ford & Partners. 17th March Project Team meet to plan the Public Meeting and discuss applications to grant-making bodies. 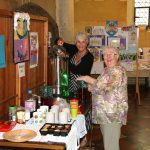 11th June Friends of All Saints ‘Open Day’ held at church with an art exhibition by local schools and adult groups, a talk, tour and outdoor cream teas overlooking the river. 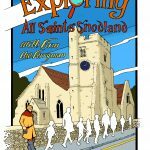 7th July Year 6 children from Snodland C of E Primary School trial visit All Saints Church to learn about Christian pilgrimage and use the ‘Snodland Stones’ prayer walk symbols to reflect upon their own journeys of life. 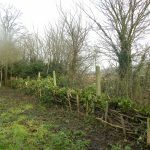 Several Wednesdays in October A ‘Community Payback’ team work in the churchyard clear ivy from gravestones and do some dead hedging on the bank above the river. 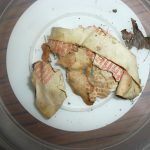 6th December PCC discuss with the architect the condition of the fabric highlighted by the investigations report (in particular the risk of falling cement and plaster). 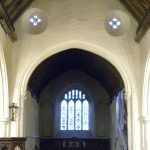 Formal approval given to the architect to apply to the HLF for additional funding; decision taken to proceed with the Delivery Stage of the project subject to funding (the required match funding was in place); and decision also taken, in the light of the investigations report, to request from the Bishop the temporary closure of All Saints Church until the relevant repairs were completed. 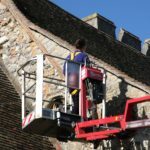 4th April A special, additional meeting of the PCC approves guidelines and priorities for carrying out the project and approves a formal proposal to go forward with it. 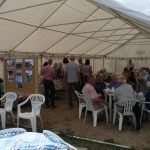 25th June ‘Friends of All Saints’ Summer Garden Party in Rectory garden including an update for ‘friends’, donors and supporters on the HLF urgent repair project. 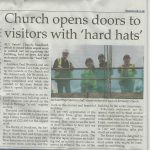 19th August An adult ‘hard hat’ afternoon at All Saints church included tours of the scaffolding both externally up the side of the tower and internally above the chancel arch. 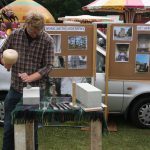 The event included cream teas and a presentation by the architect, Paul Sharrock. 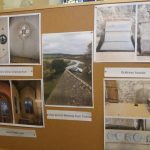 26th October Discovery during the course of repairs of possible pre-Reformation textual fragments in a wall cavity near former chimney announced to Client Meeting. 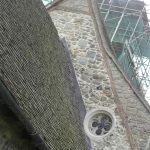 10th November Internal and external work on the stonework above the chancel arch is complete and the scaffolding being removed. 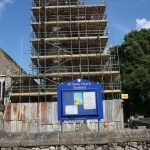 High level repairs to tower and bell-ringing floor nearing completion. 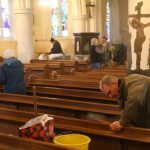 2nd December A working party of about 30 volunteers spend a good part of the day cleaning the church in preparation for its reopening for services the following day, Sunday 3rd December. 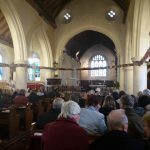 A Service of Thanksgiving and Rededication was held following the completion of the main repair work. 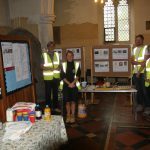 It was attended by a wide range of people from the local community as well as by those like the architect and stonemasons directly involved in the project. 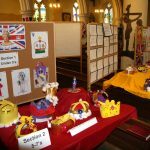 There were displays of photographs and artifacts related to the work. 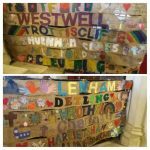 All around the church was festooned with 56 large hessian strips embroidered and decorated by different groups and organisations within Snodland. 13 May Launch of new circular walk leaflet, produced in conjunction with the Kent Wildlife Trust. 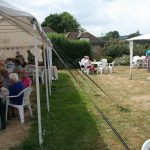 Around 30 people gathered for a picnic lunch in All Saints churchyard and afterwards set off on two mini-pilgrimage walks (part of the national ‘Thy Kingdom Come’ week). The main walk was led by Helen Keller from KWT using the new leaflets. 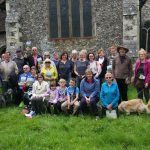 The walkers returned to the church for some welcome tea and an outdoor service using the recently installed Snodland Stones prayer walk.